With hedge funds failing for years in their struggle to generate alpha in a time when legal insider trading in the form of "expert networks" has long been eliminated following the infamous SAC crackdown, and a 3% drop in the market is enough to cause a shockwave ripple around the globe as central bankers have been tasked with avoiding any declines in capital markets - thus eliminating the need to "hedge" - one increasingly popular approach to trading that has captivated asset managers has become machine learning, or the ability to tap huge data sets, such as social media postings in ways that no mere human could. Yet, despite the enormous potential, its record remains mixed. According to Bloomberg, the Eurekahedge AI Hedge Fund Index, which tracks the returns of 13 hedge funds that use machine learning, has gained only 7% a year for the past five years, while the S&P 500 returned 13% annually. After peaking in January, in 2018 the Eurekahedge benchmark dropped 5% through September. What is the reason behind this disappointing performance for a strategy for which so many hedge funds had such great expectations? Simple: machines programmed to find a pattern within the noise of the market will always do so... even when there is no actual pattern at all. According to Marcos López de Prado, who joined AQR Capital Management as head of machine learning in September, one of the potential pitfalls for machine learning strategies is the extremely low signal-to-noise ratio in financial markets: "Machine learning algorithms will always identify a pattern, even if there is none," he says. In other words, as Bloomberg's Jon Asmundsseon notes, algorithms can view flukes as patterns and hence are likely to identify false strategies. "It takes a deep knowledge of the markets to apply machine learning successfully to financial series," López de Prado says, explaining the biggest failing with a strategy that tries to replicate human skill and intuition when it comes to the most complex of non-linear systems: the market. Nigol Koulajian, the founder and CIO at Quest Partners, a New York-based systematic macro hedge fund that manages $1.7 billion, echoes that view and says that quants coming out of finance programs and high-tech companies often expect to create optimizations at a much higher level of precision than is warranted in finance. “They’re coming with a mindset that we’re going to conquer the world with big data,” Koulajian says. In finance, though, predicting the future from past results is folly as market regimes are never static, and always change unlike closed systems like a chess game. “You can have one little pin drop that can basically make you lose over 20 years of returns,” he said. And the most likely bubble to pop should the pin drop at the wrong angle, is the BTFD bubble. A favorite "strategy" of machine learning algos has been to buy the dip: for the past decade, BTFD has been the one risk-on strategy that worked without fail. "Everyone’s buying the dips," Koulajian says. "There are all these people who have learned to basically suppress the vol." Of course, the reason buying the dip works is because everyone believes buying the dip works, i.e., correlation has become causation. And for those who use machine learning, there are dozens of versions of this strategy that can be implemented. The risk, according to Koulajian, is that the relentless bull market that made such strategies work so well was driven by central bank liquidity—and that’s being pulled away now. Meanwhile, skew, a measure of tail risk, is implying the S&P 500 could fall 30 percent, Koulajian says: In August, the CBOE Skew Index, which tracks out-of-the-money index options, reached a record high. If you’re buying the dips with machine learning, Koulajian says, it’s easy to congratulate yourself on using much more complex model optimization and lose sight of the larger risks. The best perspective, however, comes from the man who has made billions implementing it some three decades ago, because for all its sophisticated incarnations, machine learning is not new. In the late 1980s, Robert Frey started a hedge fund that was absorbed a few years later into Renaissance Technologies, where it became the nucleus of the statistical arbitrage strategy in the enormously successful Medallion Fund. Having made his money, Frey retired from Renaissance in 2004 and started the quantitative finance program at Stony Brook University as well as opening a family office, which became FQS Capital Partners LP. At FQS, Frey uses machine learning techniques to evaluate hedge funds, focusing on modeling their underlying behavior and tying it back to systematic market and economic trends. In addition to disappointing 2018 performance, some remain skeptical that machine learning is the holy grail of investing. Stephen Cucchiaro, president and CIO of 3Edge Asset Management LP, a Boston-based exchange-traded fund strategist that oversees $850 million, is another longtime user of machine learning techniques. He started off managing portfolios of ETFs in 1994 with the observation that capital markets represent a nonlinear complex system, which was exactly what he’d studied in the branch of mathematics called system dynamics. Cucchiaro, correctly, says trying to tease out relationships from correlations in market data is a fool’s game. “No scientist or engineer would ever use correlation analysis for analyzing a nonlinear complex system of interrelated variables,” he says, “because those correlations are often nothing more than statistical coincidences, not true cause-and-effect relationships.” 3Edge’s model is based on causal factors that are regime-dependent and nonlinear, and the firm uses algorithms derived from AI to search for optimizations that also take into account key portfolio characteristics. “Our end solution is very different from more traditional AI approaches since we end up with a model that provides us with not only a prediction of market behavior but also an explanation of why,” Cucchiaro says. Despite its inherent misgivings, some have found machine learning to be quite profitable. Jamie Wise, CEO at Periscope Capital Inc., a $250 million Toronto hedge fund, says there’s a general idea out there that AI is all-knowing and that it’s going to take all of our jobs. Yet after developing a strategy that uses neural networks and machine learning, he sees it in considerably more mundane terms. “It’s really just a tool—and it’s a very task-specific tool, too,” he says. Wise's idea was to capitalize on shifts in sentiment as disclosed in public forums, so Wise’s firm began researching stock chat rooms. At first, he says, they found a lot of what you might expect: Stock promoters touting thinly traded, small-cap, pump-and-dump candidates. But then the conversation started to grow. “StockTwits was a really big part of that,” Wise says, referring to the social network for investors and traders that started in 2008. “So was Twitter.” In 2012, Twitter added cashtags—$ followed by a ticker symbol—to tag tweets related to a given company. That led to more people posting about their stocks on the platform, Wise says. “And the bigger the stock, the more likely it was that people were talking about it,” he says. 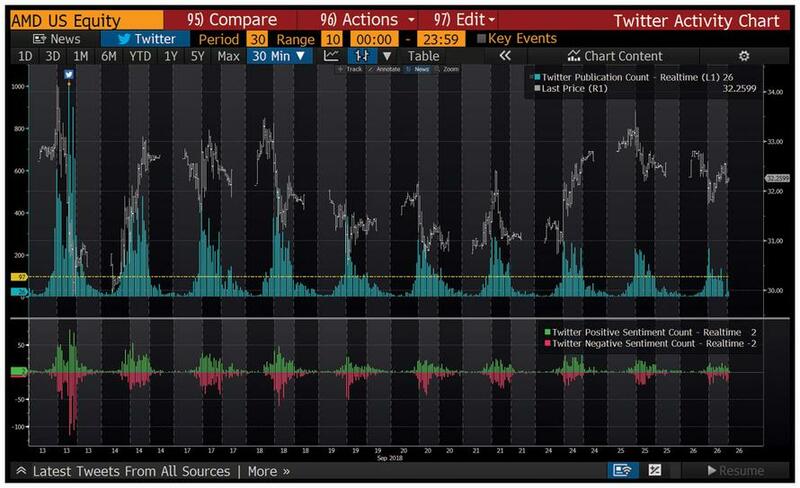 Charting Twitter activity for a selected stock. The firm eventually found a niche in which to differentiate itself, and unlike simple sentiment-based strategies that seek to jump in and trade based on a spike in social media postings, Periscope took a longer view. Ultimately, Wise's vision of how to trade base on sentiment materialized when he opened a hedge fund this May that trades based on this strategy. Additionally, as a proof of concept, he also started an ETF based on the approach. The $11 million BUZZ US Sentiment Leaders ETF has returned an average of 21% a year from inception in 2016. It gained 25% this year through Oct. 5. The ETF held 75 stocks. Sixty-four of them were included in the S&P 500 Index, yet the ETF almost doubled the performance of the S&P 500 this year. However, recent performance shows how impacted this strategy can be when market euphoria - and sentiment - fizzles. The ETF tumbled 10% in the 11 days since October 1, recouping some of its losses on Friday. While forced pattern recognition, false signals and confusing correlation with causation are the biggest drawbacks of machine learning, this approach to finance also has its powerful uses and López de Prado has a couple of favorites. A second is portfolio construction. “Machine learning algorithms can model complex data structures much better than Markowitz-style solutions—and yield superior performance out-of-sample,” he says, referring to the mean-variance model of portfolio construction developed by Nobel laureate Harry Markowitz. Ultimately, Medallion's unprecedented profitability over the past three decades notwithstanding, it remains to be seen if machine learning and AI can outsmart the signal, and noise, that is the general market. In the end, beating the collective wisdom of the crowds is much more difficult than recognizing faces or driving cars. But the biggest test of just how "artificial" the artificial intelligence in machine learning is, will come when buying the dip - the one strategy that has so far always been profitable - no longer works. It is how the machines respond and adapt to a brave new world without correlation, or causation, backstops that will determine whether a mathematical representation of reality can ultimately outsmart reality itself.